India's massive bet on solar power is paying off far earlier than anticipated. The price of solar power has plummeted in recent months to levels rivaling that of coal, positioning the renewable source as a viable mainstream option in a country where 300 million people live without electricity. Solar prices are now within 15% of coal, according to KPMG. If current trends hold, the consultancy predicts electricity from solar will actually be 10% cheaper than domestic coal by 2020. And that could turn out to be a conservative forecast. At a recent government auction, the winning bidder offered to sell electricity generated by a project in sunny Rajasthan for 4.34 rupees (6 cents) per kilowatt hour, roughly the same price as some recent coal projects. "Solar is very competitive," said Vinay Rustagi of renewable energy consultancy Bridge to India. "It's a huge relief for countries like India which want to get more and more solar power." Prime Minister Narendra Modi has made access to electricity a top priority, and has set the goal of making 24-hour power available to all 1.3 billion Indians. Currently, even India's biggest cities suffer from frequent power outages. To improve the power supply, Modi has set the goal of bringing 100 gigawatts of solar-based power online by 2022, a twenty-fold increase from current levels. Infrastructure must also be improved and the 280 gigawatt electric grid needs to be expanded and modernized. "The industry in general is fairly bullish," said Anshu Bharadwaj, executive director at Center for Study of Science, Technology and Policy. "I don't think they can ask for a better scenario." 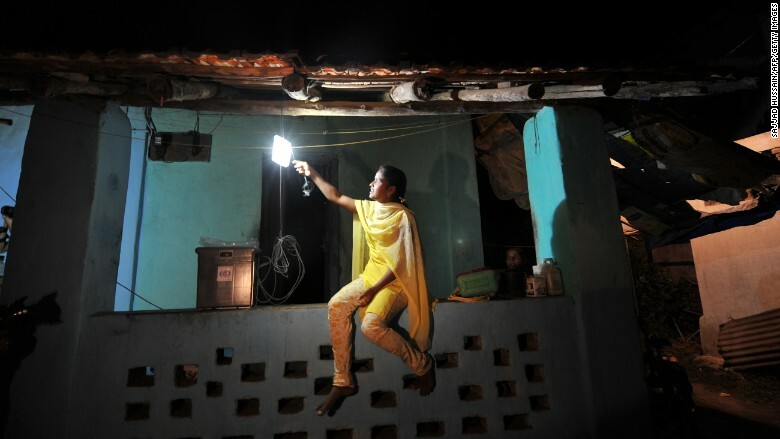 A woman turns on a solar-powered light at her home near Mumbai. There are reasons to push solar beyond its low price -- it's a much healthier option in a country that is home to 13 of the world's 20 most polluted cities. The environmental benefits of solar will be even more pronounced if its rise comes at the expense of coal, which currently makes up 60% of India's energy production. India's coal has a high ash content, and it releases toxins and metals into the air when burned. "In the very long term ... [solar investments] can help reduce air pollution," said Aruna Kumarankandath, a program officer at the Centre for Science and Environment. But Modi has so far taken a different approach. In order to expand electricity access as quickly as possible, he wants to double double coal production by 2020. "It's important to emphasize that coal is going to remain a crucial part of India's future," said Sasha Riser-Kositsky, an associate at Eurasia Group.